With the ever increasing demands within our industry for high quality sealing products and with such diversity of applications, We offer a complete range of sealing products from soft cut gaskets in nonasbestos materials to semi-metallic and full metallic gaskets. We are supported by the leading material manufactures in the industry and enjoy full technical backup to accommodate most operations. To satisfy the demands of our customers we hold extensive stocks of sheeting, cut gaskets, metallic and semi-metallic gaskets, industrial textiles, boiler spares and various gland packings for pumps and valves. Compressed sheet fibre jointing is designed for a wide range of industrial and original equipment applications where sealing performance and specification are essential. Based on high performance, reinforcing fibres blended with elastomeric binders and inorganic fillers, the Novus materials offer outstanding performance in a range of industrial applications. Compressed fibre sheet jointing is used in many industrial applications including chemical processing, aerospace, automotive and water. The sheets are manufactured using the calendaring process in which a mixture of fibres, filler and binders is compressed between two rollers under load. A wide variety of these components can be formulated using this process and subsequently materials can be designed to function over an extensive range of fluids, pressures and temperatures. The suitability of compressed fibre sheet grade in a given application is dependent on a number of factors including chemical resistance and temperature and pressure capability. To assist our customers to make informed choices as to the suitability of a product for a particular application, these materials are subjected to a wide range of tests as specified by the statutory regulations and customer requirements. A key approval is BS 7531. This standard provides a method for selecting compressed fibre grades based on their performance characteristics. A material that meets the requirements of BS 7531 can be considered high quality, high performance materials. BS 7531 defines two standards for these materials: Grade X and Grade Y. Grade X is the higher specification and requires the material to meet a range of property criteria that would allow the material to be used in high temperature and other demanding applications. Grade Y also defines a range of property criteria but the requirements are less demanding than for Grade X. Flexible graphite materials are universal sealing products consisting of pure carbon in which the crystalline structure has been considerably expanded through a special chemical and thermal procedure. The expanded crystals are formed into foil by a multi-stage calendaring process. The thin flexible graphite foil can then be laminated into thicker sheets to manufacture a range of sealing products. This process can also be made into other forms such as packing set. Graphite has an outstanding resistance to high and low temperature and is chemically resistance to virtually all media. With a high compressibility and unlimited storage life it is ideal for many applications. Polyterafluoroethylele (PTFE) is almost chemically inert being attacked only under extreme conditions by, for example, molten alkali metals, certain fluorine compounds at elevated temperature and nuclear radiation. In this respect PTFE is very useful as a gasket material, but unfortunately, the material has a tendency to creep under load and has limited use in such applications. Modified PTFE materials allow the benefits of PTFE to be utilised at a higher compressive loads and higher temperatures. 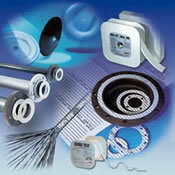 Foe example, expansion of PTFE produces a softer material with a higher strength than conventional PTFE. PTFE can also be used as an envelope to more conventional compressed fibre gasket material insert. This combines the chemical resistance of the PTFE with the stress retention and recovery properties of the insert. Spiral Wound Gaskets consist of a 'V' shaped metal strip spirally wound in combination with a soft filler material, normally graphite, PTFE or Hi-Temp. The metal strip provides outstanding recovery whilst the flexible filler ensures excellent sealing. 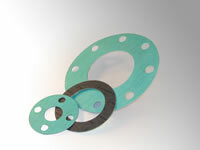 Depending on the application the gasket can be specified with outer and/or inner rings. Kamprofile Gaskets consist of a metal core, generally stainless steel, with concentric grooves on either side. A sealing layer is normally applied to both faces and depending on the service the material for this layer can be graphite, PTFE, Novus Sheet material or metal (e.g. Aluminium or silver). Kamprofile gaskets are ideal for both standard pipe and heat exchanger applications. Corrugated Metal Gaskets consist of a corrugated metal core, normally stainless steel, with a soft facing layer applied to each face. The corrugations provide resilience and reduce the sealing surface area of the gasket while the soft layer ensures outstanding sealing, even at low loads. Particularly suited as a replacement to metal jacketed gaskets. Metal Jacketed Gaskets consist of soft filler material encapsulated in a metallic material. The filler material provides the gasket with compressibility and resilience while the jacket provides compressive strength and blow out resistance.